Isinkwe Safaris Bushcamp, home to the Bushbaby, offers budget accommodation. 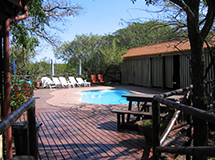 A bush lodge, 15 km South from Hluhluwe, inclusive of breakfast and a home-cooked dinner served from our canteen at the "Africa Bush Junction next to the swimming pool. Isinkwe Safaris specializes in a variety of daytrip tours to Hluhluwe/iMfolozi Park, as well as the Isimangaliso (St Lucia) Wetlands Park. 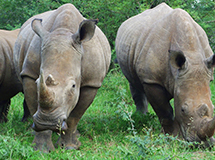 Our passionate field guides are very knowledgable about the wildlife in the region and spend many hours guiding tours to Hluhluwe/Imfolozi Park. Established in 1995, ISINKWE SAFARIS is a "hand made" company, created and operated by the Davies family. 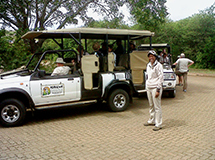 Our professional services are on offer to all tour operators and travel agents who wish to offer a personalised safari experience within the Hluhluwe / Imfolozi and Greater St. Lucia Wetlands Parks. 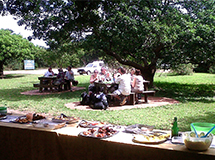 Picnic buffet-style or packed lunches are available and presented by our catering staff to groups on safari in the Hluhluwe / Imfolozi Park. The word "ISINKWE" (pronounced "I" - "sink" - "we"), is the Zulu translation of the Thick Tailed Bushbaby. These strange nocturnal animals are classified under the primate family and frequent the lodge at night. Their distinctive and thrilling night-time cries are part of the evening bush sounds.Keep a look out for them in the evenings during your stay. Isinkwe Bushcamp and Isinkwe Safaris were founded in 1995 by the Davies family and have since developed into a quality 45 bed bush camp and a six vehicle tour company. The dedication and attention to detail of the family and staff members are aimed at making your stay as comfortable and enjoyable as possible. Since its inception Isinkwe has successfully maintained sustainable job opportunities for more than 15 persons from the local neighbouring communities, at any time. We are proud to say that our venture has been progressively developed by all persons involved over the past years. We also strive to ensure that we operate our tourism business in an environmentally friendly manner and hope to see the long term preservation of all wildlife ecosystems within our region.